Today, many kids are raised in houses full of fancy gadgetry, leased cars, and massive debt. Those kids aren’t exactly learning the best financial lessons from their parents when it comes to money management. Personally, I want my daughter to subscribe to the life of frugality I’ve chosen, because that choice has taught me so much more than just how to save money. We all want what’s best for our kids, and that should include teaching them how to handle their money well as they grow into adults. I don’t know about you, but I don’t want to watch my daughter to rack up tens of thousands dollars of debt in her 20s. I want to teach her how to be a good steward of her money and how to live frugally, and I want to lead by example. Does that sound like something you’re after with your own children? 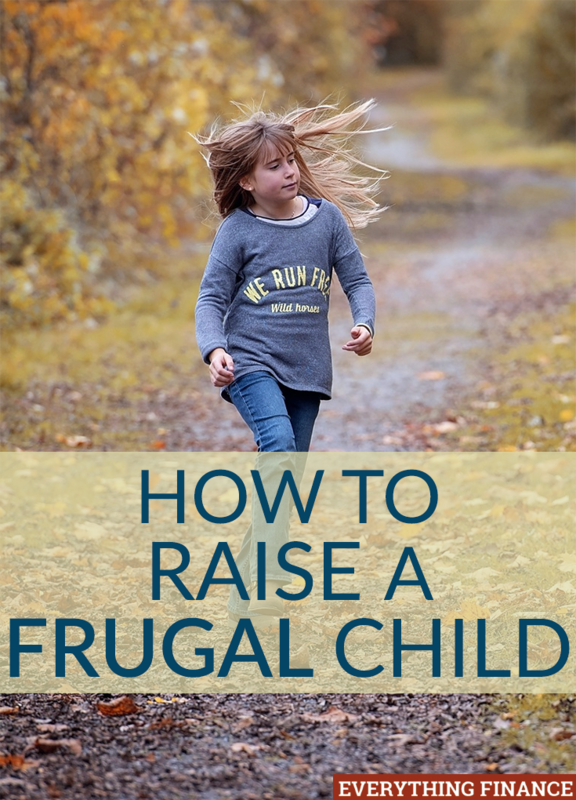 Then read on for my tips on how to raise a frugal child. First of all, if we aren’t good with money ourselves, then we aren’t going to set a healthy example for our kids. They’re constantly watching us, and they’ll learn from the example we set. Being a good example to our kids includes having healthy financial conversations in front of them (to an extent) with our spouses and managing our own finances well. This includes paying off all debts, setting a household budget, and paying our bills on time. These are basic skills that we ourselves should master so we can pass them along to our kids. Since my daughter was a newborn, I have only purchased her secondhand clothing (with exception to underwear), and it’s something I still swear by now that she’s 4. I gladly accept hand-me-downs from others, and I regularly shop yard sales and the amazing biannual consignment sales that we have in our area. It’s where I buy 95% of her clothing and I feel no shame about it. So many people associate used goods with being dirty, which is not the case, and I don’t want her to think that. At 4, she gets so excited to go through the “new” clothes that I’ve brought home for her, and she doesn’t care if they’re missing store tags. Since we’ve always done this, she doesn’t know the difference. Because I choose quality, used pieces, no one else knows the difference either, and she’s one of the most well-dressed kids in her class at a fraction of the price. Even better, when she outgrows the clothing that’s still in good condition, I resell it myself to earn some of my money back. It’s a great system I’m glad I discovered early on, and I can’t even imagine walking into a mall to buy her a new outfit today, even on sale. The same idea can be used for toys at Christmas and birthdays. There’s nothing wrong with buying a used toy on Craigslist or eBay that your kid is dying to have, especially if it saves you 75% off the new price. As a child, I grew up in a small 1950s house. Somehow, my mom and dad raised three kids in a house that was only about 1,300 square feet. From time to time, my parents wished for a larger home like some of our friends had. However, they always said they would rather take us on vacation each year than have a fancier house. So every year, without fail, we went on a vacation that my parents had budgeted for all year-long, and I have so many great memories of the places we traveled. Although none of our vacations were extravagant, we were spending time together as a family in a new place, and that was exciting. Today, I have the same values. I have a small home that I own free and clear, and our priority is to travel and have new experiences as a family. No amount of fancy cars or extra square footage is going to entice me to give that up. Now that Christmas is right around the corner, here’s something you can implement now. The rule of 4 limits gift giving to 4 gifts per child. Something you want, something you need, something you wear, something you read. Starting this year, reconsider how you approach gift-giving. So many people love to pile present after present under the tree for their kids, to the point that there’s a gift mound so large you can’t even see the floor. Once your kids start opening presents, paper starts flying, they spring from one gift to the next, and it’s all over before you know it. You may not even have gotten to see everything that was opened. You don’t want to raise a child that, after opening 15 Christmas presents, asks, “Is that all?” Personally, that would make me feel like I failed as a parent. I don’t want my daughter to associate excess with Christmas, and I don’t want her to expect a bigger pile of plastic toys at each Christmas. That doesn’t build character, and that’s not the kind of girl I want her to be, so we limit Christmas gift-giving to a few quality gifts that we know she’ll love. The rule of 4 helps us adhere to that. I know that grocery shopping is much easier to do without your kids tagging along, but it’s so important to let them learn how much food costs at the grocery store. Let them watch you use coupons and give money to the cashier. Let them help you choose and plan meals so they feel like they have an important role in the process, and even let them push around one of those mini carts if they want. Teach them how to compare prices and the differences between brand-name and off-brand products. Even the smallest toddlers can get in on the action. Give them a list of pictures they can be on the lookout for, such as apples, bananas, and milk, and treat it as a game. There are so, so, so many reasons to limit screen time, and teaching the importance of frugality is another reason to add to the list. If your kids are occupied by a 30 minute TV show, then they are being barraged with 8 full minutes of advertisements geared straight towards them, and their little brains don’t have the capacity to block out those advertisements yet, like we sometimes do as adults. Unfortunately, it’s not yet illegal in this country to market to toddlers, preschoolers, and young kids, so until that time comes, it’s up to us as parents to limit the influence that this advertising has on our kids. Watching a program isn’t bad in and of itself, so if you choose to let them watch a show, pick a movie that you own or a DVD from the library, which will prevent the commercial problem. Even if it’s only birthday money or a few dollars here and there that they get to have, let them take control of their money. It can be in a piggy bank, a small wallet, a child’s savings account, or even an investment account. Let your child spend, save, donate, or invest a small amount of money so they can learn how the process works. We’ve all learned about our finances through trial and error, and the earlier you start with your kids, the better off they’ll be at managing their own finances in the future. By teaching our kids the art of frugality and how to manage their money well, we can set them up to lead purpose-driven lives where they don’t have to constantly struggle with money. Sure, they’ll still make mistakes along the way, but teaching them how to live frugally from the get-go will give them the tools they need to save their money when they are on their own financially. What financial tools do you want to pass along to your own children? Do you buy secondhand products? What financial mistakes have you made that you hope your children will avoid? My kids may have bad examples in their life when it comes to how to manage finances (I won’t name any names) but you can be damn sure I won’t be one of them and I’ll try my hardest to teach them how to be financially responsible. I can only hope that my explanation of the virtues of frugality and why burying yourself in debt is something you should avoid will stick. How Much Will Having a Child Cost You in JUST the 1st Year?